What Happens In A 50-50 Senate? Even More Joe Biden : It's All Politics With polling suggesting there's a decent chance of a tied Senate next year, the gaffe-prone vice president could cut an even higher profile. 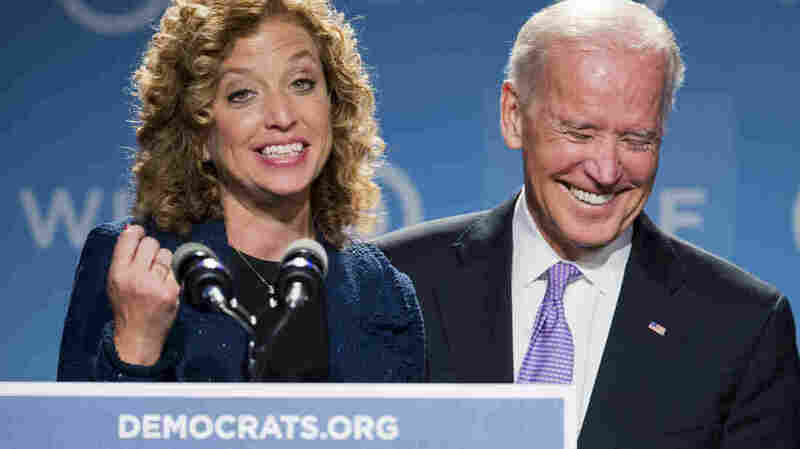 Vice President Biden laughs as he is introduced by DNC Chair Rep. Debbie Wasserman Schultz, D-Fla., at the DNC Women's Leadership conference in Washington, Friday. At the event, Biden praised former GOP Sen. Bob Packwood, who resigned from the Senate in 1995 after allegations of sexual misconduct. If you didn't get enough Joe Biden this week — choose your favorite gaffe, "Shylocks," "Orient," or the tin-eared Bob Packwood reference — there's good news. With Senate polling that shows toss-up races in as many as eight states, there's a decent chance that 2015 could showcase the vice president even more. Because while the Senate could end up, say, 51-49 in favor of Democrats or 48-52 in favor of Republicans, it's equally likely right now that it will wind up exactly 50-50. What that 50-50 split might mean for Washington gridlock is unclear — after all, it pretty much takes 60 votes in the Senate to move legislation that's the least bit controversial. The one thing it would definitely mean is a higher profile for the free-talking, Amtrak-riding Delawarean. As we might recall from grade-school civics, the vice president of the United States also serves as president of the Senate, and is able to cast tie-breaking votes. From the standpoint of Senate process, this is obviously good for Democrats. It would keep them in control of the agenda and let them continue to approve President Obama's executive and judicial appointees. But what about from the standpoint of Biden — particularly if he winds up running for president in 2016? On the one hand, he would instantly have a higher profile role in government – he would be more a player, and less a sidekick. He would cast votes on important legislation supporting the president's agenda. And as a higher profile player, even more of what he says will make the news. The downside: That higher profile role in government would be in the United States Senate, which is technically a part of Congress and highly unpopular. And while many Americans will support those tie-breaking votes he casts, many others will not. Yet the biggest potential downside: As a higher profile player, even more of what he says will indeed make the news.